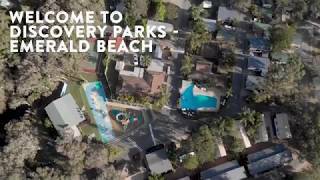 You’ll quickly see why Discovery Parks - Emerald Beach (formerly Big4 Discovery Parks - Emerald Beach) is an award-winning holiday park. Beachfront? Check. Family friendly? Check. Australia’s most desirable climate? Check. Situated on the North Coast, midway between Sydney and Brisbane and close to stunning Coffs Harbour, this park offers some of the best accommodation facilities around. Emerald Beach, one of the region’s top beaches and surf spots, is a stone’s throw away. Local rivers and creeks are ideal for kayak or canoe exploration. Take the Solitary Islands Coastal Walk past golden beaches, rocky headlands and lush rainforest. Witness the migration of thousands of humpback whales from late May. They boast some of the best caravan park facilities Coffs Harbour has to offer and everything is designed with your comfort in mind. Everything is close by, well maintained and regularly upgraded. Not to mention, the beautiful Emerald Beach is just a stone's throw away for a perfect spot to swim, surf, snorkel and play in the ocean. Or enjoy the simplicity of the green grass and shady trees that surround your accommodation. Their staff warmly welcome you to their beautiful piece of paradise.